Some people wonder if dental radiographs are safe because they expose the patient to radiation. Several factors and practices work together to make dental radiography safe. Dentists follow the ALARA principle, which stands for “As Low As Reasonably Achievable,” when obtaining radiographs. This radiation safety principle limits your exposure by incorporating the following techniques: use of the fastest image receptor (that is, the fastest film speed or digital speed); reduction in the size of the x-ray beam to the size of the image receptor whenever possible; use of proper exposure and processing techniques; use of leaded aprons and, whenever possible, thyroid collars. 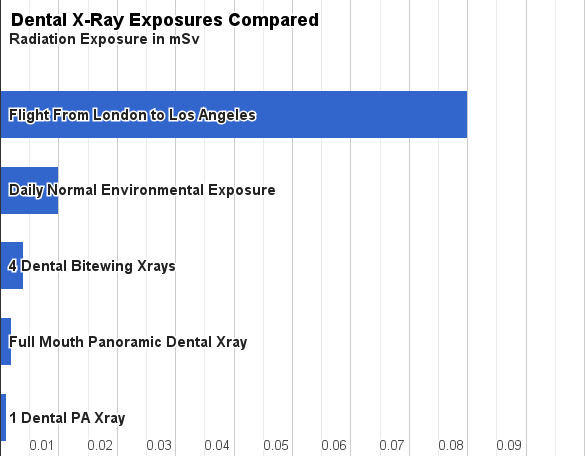 This chart should aid in the understanding of digital dental xray radiation exposures.